103 patients undergoing primary total knee arthroplasty (TKA) were randomized to evaluate the efficacy of the gap balancing approach (GB) against the measured resection technique (MR) for TKA. Patients were monitored for 24 months, and were primarily evaluated on femoral component rotation (Hollywood Perth-Protocol CT-scan) and joint-line (defined as the difference between resected bone and prosthesis thickness from femoral and tibial sides). The evidence presented in this trial indicated significantly raised joint-line associated with gap balancing when compared to the measured resection technique (MR) - and ultimately better gap symmetry. Functional outcomes, along with quality-of-life evaluations were similar throughout the trial. Blinding Treatment Providers: Was knowledge of the allocated interventions adequately prevented? Blinding Outcome Assessors: Was knowledge of the allocated interventions adequately prevented? Blinding Patients: Was knowledge of the allocated interventions adequately prevented? Was loss to follow-up (missing outcome data) infrequent? Were outcomes objective, patient-important and assessed in a manner to limit bias (ie. duplicate assessors, Independent assessors)? Was the sample size sufficiently large to assure a balance of prognosis and sufficiently large number of outcome events? Was investigator expertise/experience with both treatment and control techniques likely the same (ie.were criteria for surgeon participation/expertise provided)? The Reporting Criteria Assessment evaluates the transparency with which authors report the methodological and trial characteristics of the trial within the publication. The assessment is divided into five categories which are presented below. The Fragility Index is a tool that aids in the interpretation of significant findings, providing a measure of strength for a result. The Fragility Index represents the number of consecutive events that need to be added to a dichotomous outcome to make the finding no longer significant. A small number represents a weaker finding and a large number represents a stronger finding. Why was this study needed now? Measured resection (MR) and gap balancing (GB) are two distinct methods utilized to accomplish a balanced knee in patients undergoing total knee arthroplasty (TKA). The MR technique is focused on resecting an amount of bone equal in thickness to the prosthesis, but does not account for changes in laxity and joint gap, often leading to high variability in results, and reduced reliability. The GB approach involves performing the resections of the distal femur and proximal tibia first (while the tibial resection is done independently during MR), and uses soft tissue balancing in extension to achieve a rectangular and equal extension gap. GB allows for compensation for femoral bone loss, and takes into account the effects caused by gap changes and tissue-laxity. There is limited evidence adequately investigating the two TKA techniques and several trials use variable methodologies. What was the principal research question? Does gap-balancing (GB) improve femoral component rotation, and flexion-extension gap, while maintaining the joint-line in TKA patients, when compared to the use of measured resection (MR), as evaluated over 24 months? 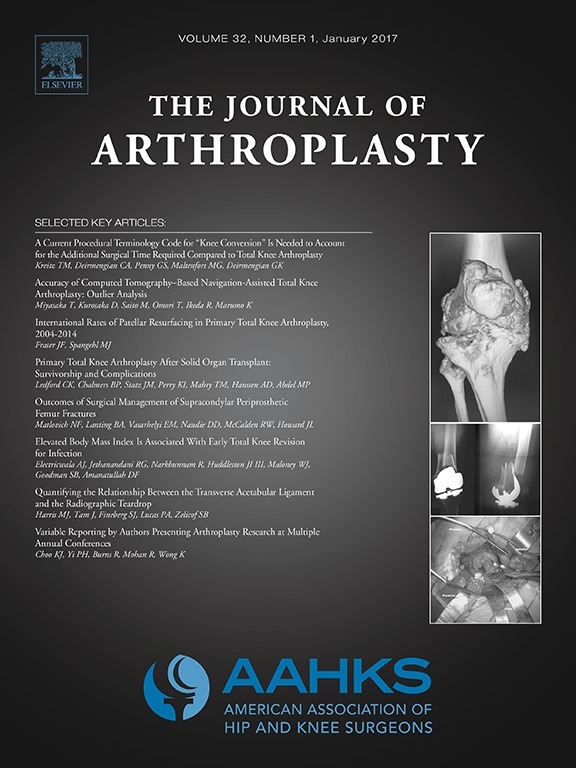 103 patients undergoing primary total knee arthroplasty were included in this study. Patients unsuitable for the primary condylar prosthesis (PFC Depuy, Warsaw, IN) were excluded. All patients were administered a modular total condylar primary prosthesis with femoral, tibial, and patellar components. Patients were evaluated based on femoral component rotation (Hollywood Perth-Protocol CT-scan), joint-line (defined as the difference between resected bone and prosthesis thickness from femoral and tibial sides), gap symmetry, and function and quality of life outcomes. Patients were monitored over 24 months, at 6 weeks, and 3, 6, 12, and 24 months. Femoral component rotation in the MR group was 2 degrees external rotation (ER; SD 2.3 degrees; range: 0 to 10 degrees) compared to 3 degrees in the GB group (SD 2.7 degrees; range 0 to 12 degrees) (p=0.277). MR and GB measurements for extension medial joint gap (11.1 SD 2.2 vs. 11.1 SD 2.5 respectively; p=0.093), lateral joint gap (11.8 SD 2.6 vs. 11.1 SD 2.7 respectively, p=0.161), and average joint gap (11.5 SD 2.3 vs. 11.0 SD 2.6 respectively; p=0.333) demonstrated similar results between the techniques. Extension medial and lateral joint gap difference was 0.75 varus (SD 1.3) in MR patients, compared to 0.00 (SD 1.3) in GB patients (p=0.004). MR and GB measurements for flexion medial joint gap (12.7 SD 2.7 vs. 12.5 SD 2.6; p=0.665), lateral joint gap (12.1 SD 2.3 vs. 12.7 SD 2.6; p=0.211), and average joint gap (12.3 SD 2.3 vs. 12.6 SD 2.4; p=0.624) indicated comparable results between groups. Flexion medial and lateral joint gap difference was -0.484 (SD 1.9) in MR patients, compared to 0.290 (SD 1.8) in GB patients (p=0.037). Comparison flexion and extension joint difference assessment indicated similar results between MR (0.88 SD 2.6) and GB (1.6 SD 2.7) patients (p=0.177). Joint line was significantly raised from both the tibial and femoral sides: Femoral joint line change in MR was 0.63 raised (SD 1.2) compared to 2.18 raised (SD 2.3) in the GB group (p<0.001). Tibial joint line change was 1.50 lowered (SD 1.5) compared to 2.14 raised (SD 2.1) respectively (p<0.001). Femoral distal resection was 9.6 (SD 1.1) in MR compared to 11.2 (SD 2.3) in GB (p<0.001). Tibial high side resection was 10.2 (SD 1.4) compared to 9.6 (SD 1.1) respectively (p=0.035). Tibial insert size was 8.08 (SD 0.4) compared to 10.08 (SD 2.1) respectively (p<0.001). Tibial low side resection (p=0.946) and tibial mean respectively (p=0.267) were similar between the two techniques. SF-12 physical and mental quality of life evaluations revealed no significant difference between groups over the course of the treatment. (all p>0.05). What should I remember most? Gap balancing technique (GB) for total knee arthroplasty demonstrated significantly raised joint-line when compared to the measured resection technique (MR), and ultimately contributed to improved gap symmetry. Functional outcomes, along with quality-of-life evaluations were similar through 24 months of the trial. How will this affect the care of my patients? The evidence presented in this study suggests that gap balancing techniques sacrifice joint line preservation to improve gap symmetry, but that this does not translate to a functional or QoL improvement over the short to medium term. This trial reported limitations of short follow-up and small sample sizes. Further large-scale studies with longer follow-ups are required to substantiate these findings.